The Office for Budget Responsibility (OBR) has come under fire from across the political spectrum following publication of its latest report accompanying the Chancellor’s Autumn Statement. The economics editor of the Financial Times Chris Giles says there ‘is not a shred of credibility’ to the OBR forecast that the unemployment rate will fall to 7.1% at the beginning of 2014 and stay there for over a year. As the Bank of England has identified 7% unemployment as the threshold for possible interest rate increases, without much conviction. But there is clearly a political merit to forecasting 7%-plus unemployment, if no logic. It certainly saves George Osborne from having to explain why interest rates could rise even before the economy has recovered its pre-recession level. Among opponents of austerity, the anti-poverty and tax campaigner Richard Murphy says the OBR’s assumptions resemble George Osborne’s ‘wish list to Santa’. James Meadway at the new economics foundation argues that both the OBR and Osborne will not reveal the true dynamic at work in the recovery which is rising consumer debt and the reflation of a property price bubble centred on London. The OBR admits it has a poor forecasting record. This is hardly surprising given that it uses the Treasury model of the economy. In all the arcane debate about ‘multipliers’ (the cumulative economic effects of government spending) a central truth tends to be obscured. The highest multiplier admitted in the Treasury/OBR model is just 1. This implies that no area of government spending can add to growth at all. Since the private sector has no magic wand to render its own investment in bridges, housing, railways or education more productive than government, then logically it is impossible for the economy to grow at all. The long-term decline of the British economy has been given an official rationale. However an examination of the OBR forecasts is revealing about the real dynamic at work in the economy. According to the OBR over the next 5 years jobs and wages will grow and the unemployment rate will fall. These central forecasts are shown in Table 1 below (excerpted from the OBR’s Table 3.5 of OBR data here). Consequently average earnings (the growth of wages and salaries divided by the number of employees) will stagnate or even fall in real terms. Measured against the CPI the OBR forecasts average earnings will return to 2011 levels only at some point in 2016. Measured against the RPI, which takes housing costs into account, real wages never recover over the forecast period. Even this scenario seems unlikely. In a stunning reversal of both pre-recession trends and the entire aim of austerity, the OBR is forecasting is that the lion’s share of the recovery will go to labour, not to capital. Table 2 below shows the distribution of the growth in nominal GDP over the next 5 years (table attached to Chart 3.20 of OBR data). Labour’s share of national income has been declining on a trend basis since the 1970s. The purpose of austerity is to reverse the natural fall in profits from a recession as sales fall but cost are unchanged or even rise (including the cost of labour). Yet the OBR’s forecast of flat or falling real wages is based on labour maintaining its share of national income or even increasing it. Perhaps the most outlandish forecast of all is reserved for the rise in business investment. The fall in business investment during the slump has now exceeded the entire fall in GDP. As government and other sectors have also cut their investment this means that total investment has now fallen far further than aggregate GDP. GDP has fallen by £40bn since the 1st quarter of 2008, business investment is £42bn lower and total investment has fallen by £61bn. It is also accepted that the primary source of the OBR’s repeated over-optimistic forecasts have been its projections for rising business investment that have failed to materialise. Yet once again the OBR is projecting a rise in the expenditure of firms in plant, machinery, building, transport equipment, and so on. Previously, SEB has shown that the investment rate (investment as a proportion of profits) of British firms has declined markedly over several decades. The OBR forecasts that profits as a proportion of GDP will peak in the second half of next year at close to current levels and that they will then gradually decline. 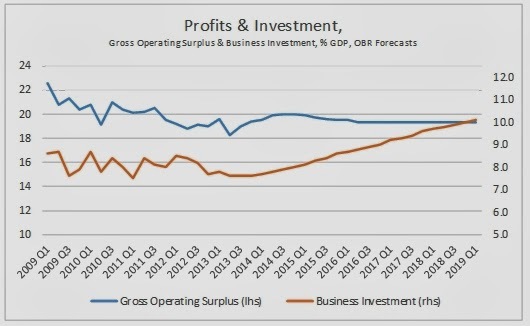 Despite this, according to the OBR, business investment will rise dramatically at the same time, from a new low of 7.6% of GDP in the 3rd quarter of 2013 to over 10% of GDP by the beginning of 2019. 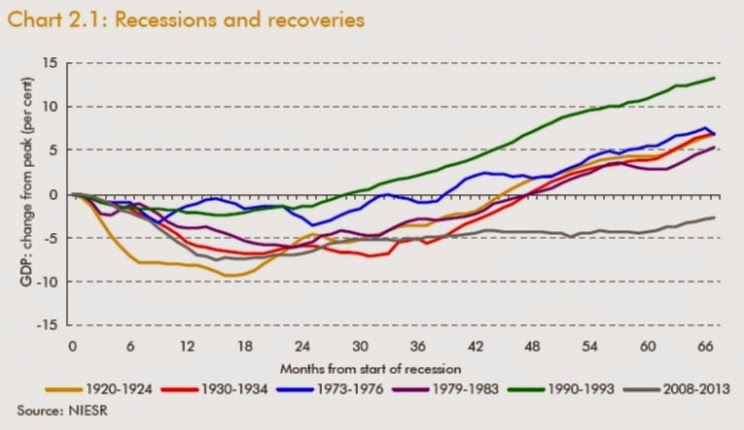 These trends and the OBR forecasts are shown in the Chart 2 below. Economic forecasting is always uncertain. But the notion that businesses will substantially increase their rate of investment while profits trend lower is fanciful. Businesses do not invest because it is socially necessary or even because the economy is growing. GDP has been rising since mid-2009 and business investment has been falling. In a market economy investment is driven by the return on it, which is profits. In reality there are only two main trajectories for the economy while austerity remains in place. 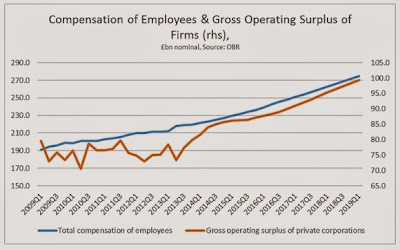 The first possibility is that the OBR’s assumptions about flat or falling real wages prove wrong and wages are driven down much further to boost profits. In that circumstance investment can rise if profits rise first. The alternative is the current pattern, where neither profits nor investment have recovered and a snail-like recovery takes place driven by increased borrowing to finance consumption. There is a third variant, which breaks from austerity. This would see the state leading an investment based-recovery using its own resources and those of the private sector to boost growth and productivity, create well-paid jobs and so allow the sustainable funding of a decent social security system. Unfortunately, without this radical change in policy, the fairytales from the OBR are likely to be a nightmare for the overwhelming majority of the population. The release of the second estimate of GDP in the 3rd quarter of 2013 marks an important milestone in the current slump. The fall in investment has for long been the driving force of the current crisis and in fact preceded it. As in many other countries investment (Gross Fixed Capital Formation) in Britain began to fall before the recession began. It also statistically accounts for the recession as the fall in investment is larger than the total fall in GDP. With the publication of the latest GDP data it is now the case that the decline in business investment alone more than accounts for the entire slump in GDP in the current crisis. It is always possible that the data could be revised substantially with the release of the third estimate in the National Accounts data (and could be revised later). But the most recent data show that the total fall in GDP since the 1st quarter of 2008 to the 3rd quarter of 2013 is £40bn. Over the same period the total decline in investment (GFCF) is £61bn. This includes investment by firms, by government and by private households. But it is firms that play a dominant role in the British economy and its level of investment. 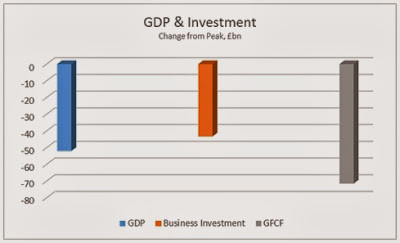 The decline in business investment now amounts to £42bn and exceeds the total decline in GDP of £40bn. These are shown in Chart1 below. The fact that the decline in both business investment and total investment can exceed the decline in GDP is accounted for by the fact that other components of growth have increased. Again, the data is subject to revision in the final release (on 20 December). But both government consumption spending and net exports have increased. The change GDP and its main components since the 1st quarter of 2008 are shown in Chart 2 below. Taken together the change in government and household consumption combined since the recession began is effectively zero. Household consumption has fallen by £15bn and government consumption, has risen by £16bn. 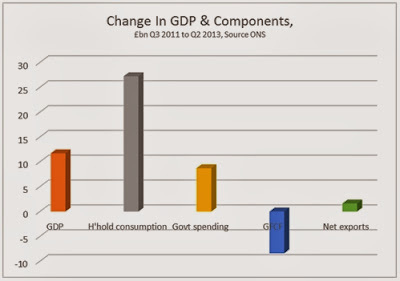 Government consumption is the component of GDP which has grown most over the period. Zero growth in consumption is hardly to be commended. Yet it is much stronger than the performance of GDP in aggregate. This belies any notion that weak demand is driving the slump. There are a series of variants of this idea, that the economy lacks ‘effective demand’ or is suffering from ‘under-consumption’ and so on. 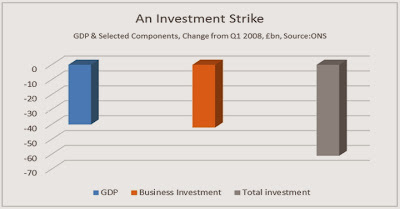 The driving force of the slump remains the fall in investment, led by the fall in business investment. The fall in business investment alone more than accounts for the entirety of the prolonged crisis. Government could act to offset this by investing on its own account, if necessary drawing on the resources of the private sector to do so. 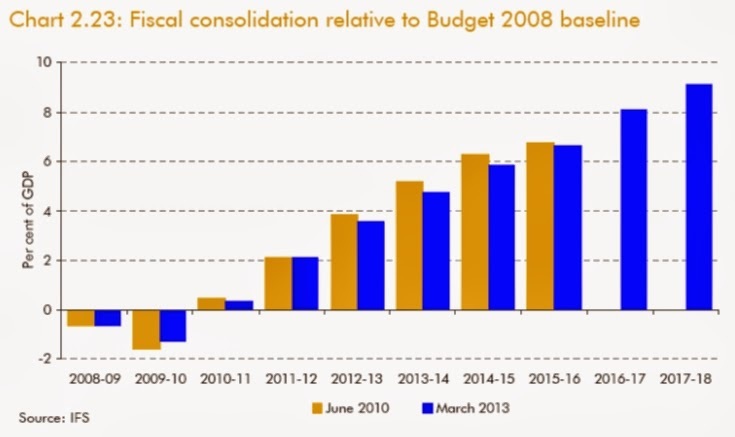 Instead, the Coalition cut public sector investment by £6bn after Labour increased it modestly. It is still the case that increased public sector investment is the only viable means of resolving the crisis that doesn’t lead to further misery for the majority of the population. In 2010 Professor Danny Quah, of the London School of Economics, noted: 'In the last 3 decades, China alone has lifted more people out of extreme poverty than the rest of the world combined. 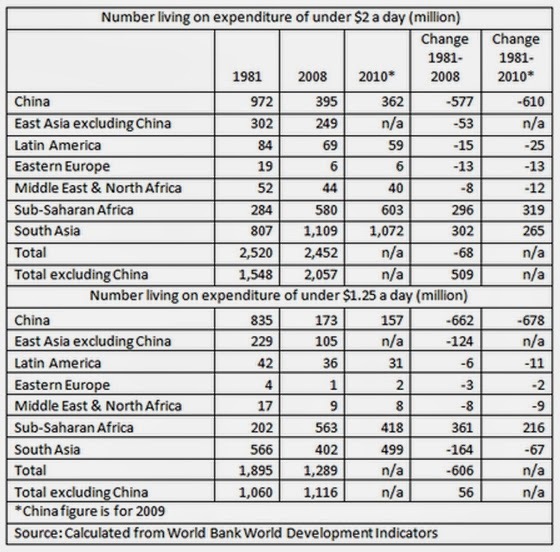 Indeed, China’s ($1/day) poverty reduction of 627 million from 1981 to 2005 exceeds the total global economy’s decline in its extremely poor from 1.9 billion to 1.4 billion over the same period.' 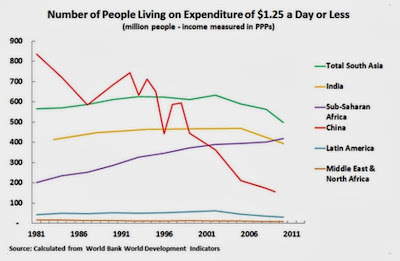 The aim of this article is to analyse the situation taking data published three years after Quah's analysis; look at the trends not only of extreme poverty, which the World Bank calculates using expenditure of $1.25 a day or less; examine a slightly wider poverty definition ($2 a day expenditure), and compare the trends in other regions of the world economy. The conclusion is simple. Quah's conclusion still holds. China is responsible for 100% of the reduction in the number of people living in poverty in the world. This finding is the necessary backdrop to any serious and informed discussion of the role of China in the world economy and its contribution to human rights. There are many remarkable economic statistics about China. China contained 22% of the world’s population when its reforms began in 1978, so the percentage of the world’s population directly benefitting from China’s rapid economic growth is seven times that of the 3% of the world’s population in the US or Japan when they began rapid growth, or the 2% of the world's population in the UK at the time of the Industrial Revolution. China’s 9.9% average increase in GDP per capita during the two last five year plans is the fastest economic growth per capita ever achieved by a major country in human history. In the same period China’s annual average 8.1% increase in household consumption, and 8.3% annual increase in total consumption, including state expenditure on items vital for quality of life such as education and health, was the fastest of any major economy. Coupled with a life expectancy above that which would be expected from China’s GDP per capita it is evident China experienced the most rapid increase in living standards of any country. Measured in Parity Purchasing Powers (PPPs) – that is the real increase in output in steel, cars, transport, services etc. - the greatest absolute increase in output ever recorded in single year by the US was in 1999 when it added $567 billion in output. But in 2010 China added $1,126 billion – more than twice the increase in output in a single year ever achieved by any other country in human history. Nevertheless, impressive as such statistics are, from the point of view of human welfare it is another number which dwarfs all others: the contribution of China to the reduction of human poverty not only within its own borders but in its impact on the world. The astonishing fact remains that China has been responsible for the entire reduction in the number of people living in absolute poverty in the world! To show this the table below gives the number of those in China and the world living on expenditure less than the two standard measures used by the World Bank to measure poverty. These are the criteria for extreme poverty, expenditure of less than $1.25 a day ($37.5 a month) and those living in poverty – expenditure of $2 day ($60 a month). Charts showing the trends are at the end of the article. 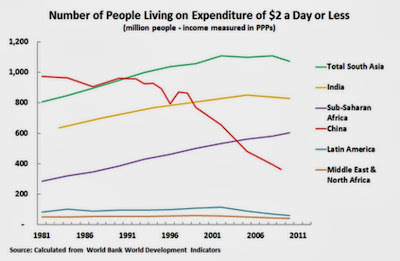 In 1981, on World Bank data 972 million people in China were living on an expenditure of less than $37.50 a month. By 2008 this had been reduced to 173 million, by 2009 it fell to 157 million. Consequently 662 million people were lifted out of extreme poverty in China in the twenty seven years up to 2008 and 678 million by 2009. In contrast the number of people living in such extreme poverty outside China increased by 50 million between 1981 and 2008 – the number of people emerging from poverty was less than the population increase. This was due to the rise in the numbe of people living in extreme poverty in sub-Saharan Africa. China was consequently responsible for 100% of the world’s reduction of the number of people living in extreme poverty. 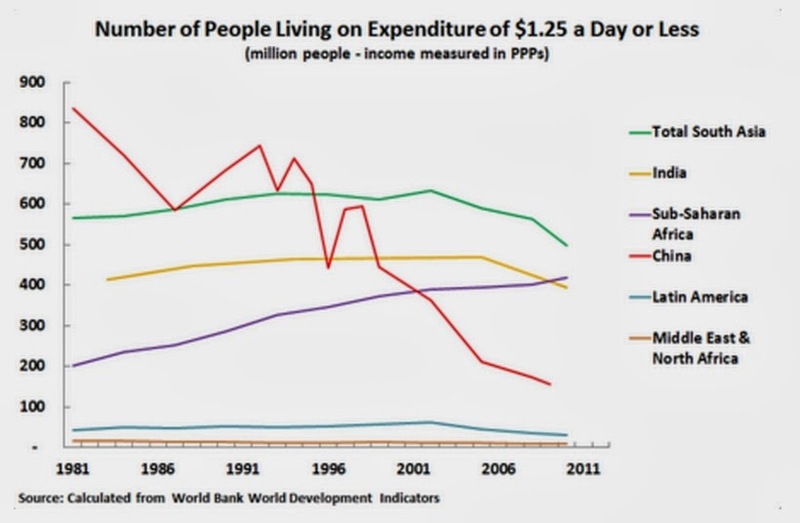 Analysing those living on $2 a day ($60 a month), still a very low figure, the trend was even more striking. The number of people in China living on an expenditure of this figure or less fell from 972 million in 1981, to 395 million in 2008, to 362 million in 2009. 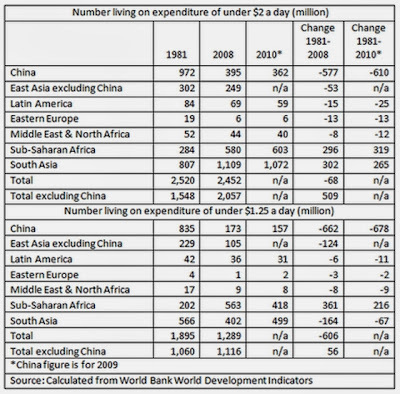 The number living on expenditure of $60 a month or less in China fell by 577 million by 2008, and by 610 million by 2009. In contrast the number of those living at this level of poverty in the world outside China rose from 1,548 million in 1981 to 2,057 million in 2008 – an increase of 509 million. 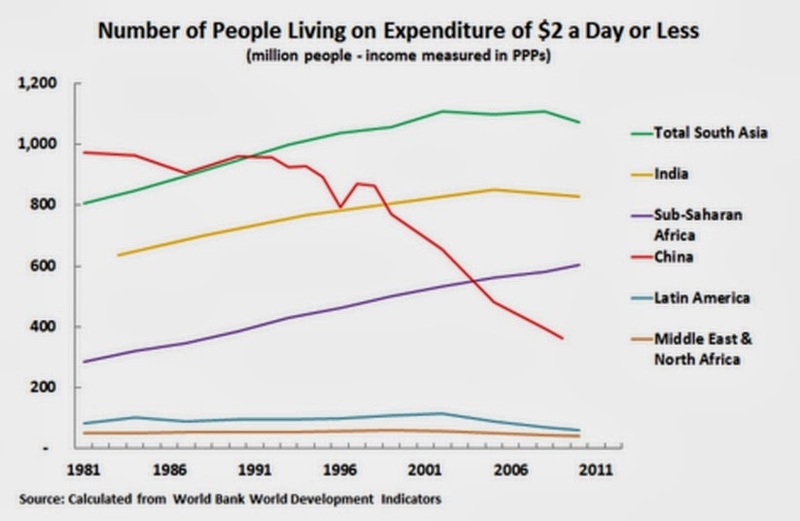 Again, China accounted for the entire reduction in the number of people in the world living at this level of poverty. It is therefore almost impossible to exaggerate what a contribution not only to its own people but to the welfare of the whole of humanity China’s economic progress has made. Without China there would have been literally no reduction in the number of world’s people living in poverty. Life expectancy in China is nine years longer than in India – a country which at the end of the 1940s had a higher GDP per capita than China. Measured per thousand people China has 66% more nurses and midwives and 160% more doctors than India. In China the literacy rate for women aged 15-24 is 99%, on the latest World Bank data, while for India it is 74%. The infant mortality rate per 1,000 live births is 12 in China compared to 44 in India. The direct and indirect effect of bringing people out of poverty is also the greatest contribution that can be made to human rights, The reality is that China’s bringing over 600 million out of poverty means no other country in the world remotely matches China’s contribution to human wellbeing and real human rights. As the British economic crisis becomes more prolonged the outbreak of stupidity that greets every new piece of important economic data becomes more generalised. Previously there has been a campaign to suggest that austerity has led to recovery when the opposite is the case. The recovery is based unsustainably on rising consumption, led by government consumption. The publication of the latest GDP data for most major economies has now led to wild suggestions that Britain is booming and is the strongest major economy in the world. The level of real GDP in Britain since the recession began at the beginning of 2008 is shown in the chart below. It is compared to the US and the Euro Area. British growth has been almost exactly the same as that of the Euro Area as a whole and significantly worse than US GDP growth. It is widely known that many countries in the Euro Area have experienced a severe Depression. Since British growth is now almost exactly the same as the average for the Euro Area as a whole during the crisis it follows that it must be worse than some and better than others. 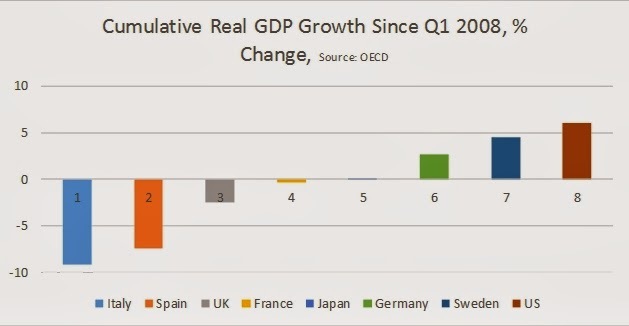 This is shown in the chart below, where among the larger economies Britain’s GDP growth is stronger than both Spain and Italy but worse than both France and Germany. Outside the Euro Area the British economy is free to set its own monetary policy and to devalue the currency. Via Quantiative Easing and a large fall in the pound it has taken advantage of both of those yet its growth is no better than the average of the Euro Area and is markedly worse than both France and Germany. British growth is also markedly worse than that of Sweden, the next largest EU economy outside the Euro Area. The cumulative change in real GDP for selected industrialised economies is shown in the chart below. Despite the potential advantage of independent policy setting the cumulative growth of the British economy is worse than the average, although not as poor as Italy and Spain. (The growth of the US economy is slightly overstated because official data now show that the US recession did not begin until the 3rd quarter of 2008). In no case is this a robust recovery in the industrialised economies either by historical standards or compared to the most dynamic economies in the world currently. Over the same period from the 1st quarter of 2008 the Chinese economy has grown by approximately 60%. Even compared to the last US recession, current performance has been variously described as ‘sluggish’ or ‘disappointing’. The US is frequently held out as a model of economic recovery. But it has recently entered its fifth year of economic expansion and GDP is just 10% above its low-point in 2009. The British ‘boom’ is much worse. The low-point of GDP occurred in mid-2009 and since that time has increased by just 5% in 5 years. And the Labour Party was responsible for just under half of that, GDP rising 2.4% in the quarters following the increased investment of the 2009 Budget. Authoritative economists such as Larry Summers (video) and Gavyn Davies and others have instead been discussing the ‘secular stagnation’ of the industrialised economies. Paul Krugman wonders whether this is ‘a permanent slump’. 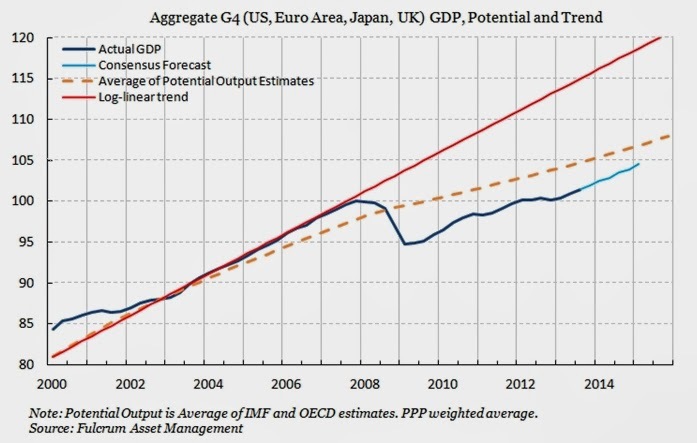 In the chart below Gavyn Davies shows the actual level of GDP in four economies combined (US, Euro Area, Japan and Britain) are shown along with the consensus forecasts for growth (the blue lines). The trend growth rate of those economies is shown the red line. The dotted yellow line shows the average estimate of potential output. The red line represents previous level of growth whereas the dotted yellow line represents the average of estimate of what is now possible for growth. In both cases, actual and forecast GDP is set to remain below those levels for some time. But much slower growth projected by the depressed level of estimated potential output shows that the dominant idea is something close to ‘secular stagnation’ for the leading industrialised economies, something like 1.2% growth per year. Summers and others correctly identify the main cause of the crisis as the slump in business investment, as SEB has argued. However he argues that this is because interest rates are above the level of anticipated return on investment. Yet the widely-acknowledged cash hoard of western firms belies this notion. The large firms which overwhelmingly account for investment have no need to borrow to invest as a result of this cash mountain. They are hoarding cash because the anticipated return itself has fallen. The anticipated return is otherwise known as the profit rate. The stark long-term consequence of this trend towards declining profitability, lower rates of investment and cash hoarding are shown in a recent chart from the OECD, below. A turning-point in the world economy occurred at the beginning of the 1970s as the long post-War boom was brought to an end. 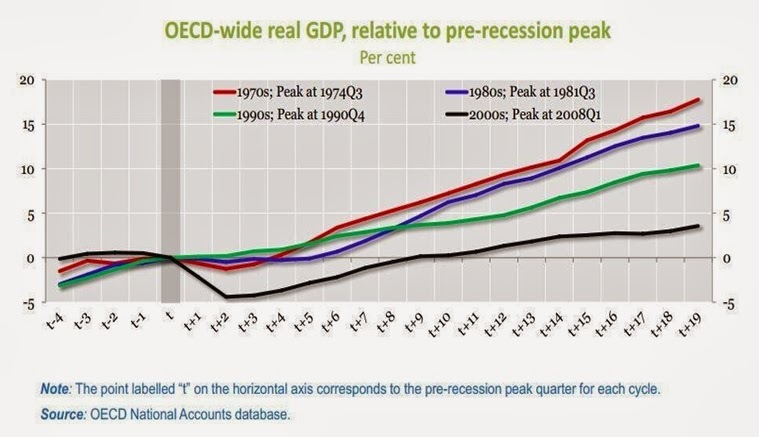 Since that time each recovery from recession in the OECD has been weaker than the preceding one. The Reagan/Thatcher offensive to restore profits has led instead to a progressive weakening of the OECD economies. The current slump had the weakest growth prior to the recession and the most severe downturn as well as the weakest recovery from it. A hat-trick of neoliberalism. The growth of the British economy conforms to these patterns and sits in the middle-to-lower band among the OECD economies. The OECD predicts 1.4% GDP growth in Britain for 2013 and 2.4% in 2014. Only a complete fraudster would describe the British economy as the strongest in the world. Only someone entirely ignorant of both recent and historical economic trends would describe either current or forecast growth in Britain as a boom. The level of public investment is falling in most of the advanced industrialised economies including Britain. The chart below appeared in the Financial Times and has attracted some publicity because it shows this decline in the US in stark terms. The difference between gross government investment and net government investment is accounted for by depreciation. All investment is subject to depreciation over time. This deducts from the level of gross investment. In the US net government investment (after depreciation) has fallen from 4% of GDP close to 1% of GDP. It is set to fall further. The chart below also appeared in the FT piece but was less remarked. It shows the various Budget proposals from the Republican and Democrat parties in Congress as well as the Obama proposals. In all cases the Budget plans are to maintain a trend decline in public investment (excluding defence spending) with just one minority proposal for a temporary increase in investment. Both the British government and the US government have talked a great deal about the need for greater investment in infrastructure and greater public investment. 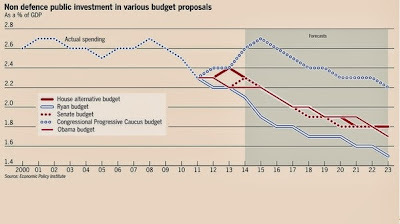 But the chart below from the Institute of Fiscal Studies (IFS) shows an even more dramatic decline in the level of net public investment in Britain than in the US. Government claims that it is promoting investment are false. 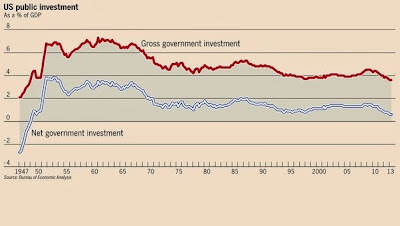 The long-run decline in public investment was interrupted during the crisis. In 2009 the Labour government had a temporary increase in public investment. SEB has peviously shown that this was responsible for a recovery which was actually more robust the the current weak upturn. It should be noted that the much earlier level of public investment was associated with much stronger rates of economic growth and increase in living standards. The Coalition government slashed public investment so far that net investment even turned negative in the Financial Year just ended. This is caused by the rate of depreciation exceeding the rate of investment. The very modest rises ahead are IFS forecasts. But this negative rate of net investment is not unprecedented. 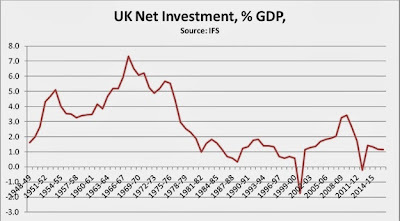 Net investment fell even more sharply at the turn of this century as the New Labour government stuck to Tory spending plans. Cuts in public investment exacerbate the cause of the current crisis which is an investment strike by firms. This is especially true as public investment is often directed towards decisive areas such as infrastructure (like flood defences) and transport (such as the rail network). When net investment falls to zero or below, things literally fall apart. Western governments remain dominated by ideas that became established in the Thatcher/Reagan era and were reinforced by Blair and Clinton. Key to these was an attempted reduction of the role of the state in the economy which was dubbed ‘getting out of the way of the private sector’ in order to boost profits. The crisis of 2008-2009 and the stagnation since have disproved that notion. George Osborne will produce the latest Autumn Statement in December. It will contain no increase in public investment. Instead he is likely to adopt very stringent future public spending targets in the hope that Labour will commit to them. If it does the Tories will then demand that Labour indentifies where it will cut, which can only damage its own support and further damage the economy. Tory spending cuts have already wrecked a recovery once. Labour’s own history shows that adopting Tory spending plans was both economically and politically damaging. The scale of the current crisis means that repeating that error would be disastrous. What are the economic alternatives to austerity? Tosh McDonald (Vice President ASLEF). Conference discussing the alternatives to austerity that Labour needs to put forward to stimulate growth, jobs and better living standards. Labour Assembly Against Austerity - a forum for Labour Party members to discuss alternatives to austerity and the policies Labour needs to stimulate growth, jobs and rising living standards. The Labour Assembly Against Austerity is an initiative of Next Generation Labour in support of the People's Assembly Against Austerity movement and is supported by Unite, UCATT, BECTU, CLPD, Labour Representation Committee, Left Futures, Chartist, Labour Briefing Co-op, Morning Star, Red Labour & Sinistra Ecologia e Liberta UK. The crisis of all the western industrialised economies is one brought about by the refusal of firms to invest, an investment strike. SEB has previously shown that for the Western economies as a whole the investment strike is leading to two simultaneous trends. While the portion of profits that remains uninvested is growing, payouts to shareholders are reaching record levels and there is a growing cash mountain held by firms. This article in The Guardian by the present author highlights that process in Britain. 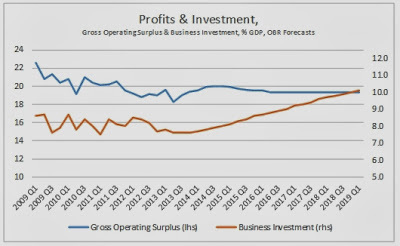 The chart below illustrates the growth of uninvested profits (and does not appear in The Guardian article). 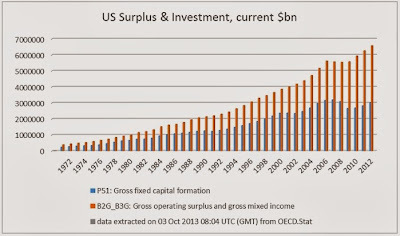 In 1970 the level of investment in the economy (Gross Fixed Capital Formation) was equivalent to over two-thirds of the gross profits of firms (Gross Operating Surplus). By 2000 this investment ratio (investment as a proportion of profits) had fallen to a little over half and declined a little more by 2007, just before the slump. But in 2012 the investment ratio had fallen to just 43%. If this investment ratio were to return now to the 1970 rate, the level of investment would rise by £122bn, or nearly 9% of GDP. There happens to be a neat coincidence between the current crisis and the combined hoarding cash and the payout to shareholders. Up to the 2nd quarter of 2013 (the 3rd quarter data are not yet available) investment had fallen by £75bn, far more than the decline in GDP (now at £40bn). £75bn is almost exactly the same rate at which companies’ cash hoard has been growing annually since the crisis began in 2008. It is also slightly exceeded by the anticipated payout to shareholders in 2013 of £80bn. Far from being ‘no money left’ these two sources alone, shareholder dividends and the growing cashing mountain, are double what is required to resolve the current crisis. Recently government ministers have taken to begging companies to invest their cash mountain, after cajoling and bribery have both failed. This can be illustrated through the government policy of cutting corporate taxes and the fallacy that this will spur investment. In 1970 corporation tax was 40% and it has been slashed by this government on the road to a 20% rate, but the investment rate has fallen by around one third. None of these government efforts will work. Privately owned firms are driven by the concept of ‘shareholder returns’, which is itself counterposed to economic well-being for the overwhelming majority of the population. For them, only the restoration of profits will encourage investment, not pleas for the general good. The soaring level of uninvested profits, and their diversion towards dividends and a growing cash mountain is the great disappearing trick of the current economic crisis. Until it is resolved the fundamental source of the crisis will remain unaltered. Supporters of ‘austerity’ would have a very strong argument if there really were no money left. In that case, opponents of current policy would be left arguing only for a fairer implementation of those policies, or that perhaps they could be implemented more slowly. This is not the case. Firms in the leading capitalist economies have been investing a declining proportion of their profits. This is the cause of the prolonged period of slow growth prior to the crisis and a number of its features such as stagnant real wages, so-called ‘financialisation’ and the growth in household debt. This negative trend of declining proportion of profits directed towards investment reached crisis proportions in 2008 and is the cause of the slump. As a consequence of the sharp fall in this investment ratio there has been a sharp rise in the both the capital distributed to shareholders and in the growth of a cash hoard held by Non-Financial Corporations (NFCs). This cash hoard is a barrier to recovery, releasing it could be the mechanism for resolving the crisis. 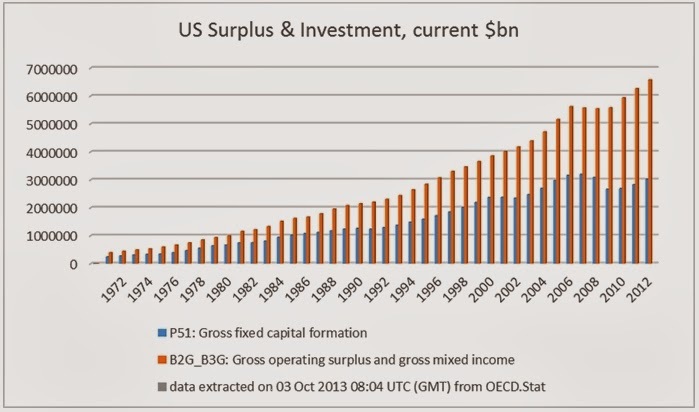 The chart below shows the level of surplus generated by US firms (Gross Operating Surplus) and the level of investment (Gross Fixed Capital Formation) for the whole economy. Since the former are only presented in nominal terms, both variables are presented here in the comparable way. The nominal increase in profits has not been matched by an increase in nominal investment. In 1971 the investment ratio (GFCF/GoS) was 62%. It peaked in 1979 at 69% but even by 2000 it was still over 61%. It declined steadily to 56% in 2008. But in 2012 it had declined to just 46%. In a truly dynamic market economy there is nothing to prevent the investment ratio from exceeding 100% as firms utilise resources greater than their own (borrowing) in order to invest and achieve greater returns. Therefore even an investment ratio of 69% is sign of a less than vigorous market economy. However the subsequent decline in the investment ratio to 46% is a sign of enfeeblement. If US firms investment ratio were simply to return to its level of 1979 the nominal increase in investment compared to 2012 levels would be over US$1.5 trillion, approaching 10% of GDP. This would be enough to resolve the current crisis, although it would not prevent the re-emergence of later crises. The uninvested portion of firms’ surplus essentially has only two destinations, either as a a return to the holders of capital (both bondholders and shareholders), or is hoarded in the form of financial assets. In the case of the US and other leading capitalist economies both phenomena have been observed. The nominal returns to capital have risen (even while the investment ratio has fallen) and financial assets including cash balances have also risen. One estimate of the former shows the dividend payout to shareholders doubling in the 8 years to 2012, an increase of US$320bn per annum. The growth of cash balances is shown in the following data from the Federal Reserve. They are the changes in key balance sheet aggregates for US non-financial corporations from 2008 to Q2 2013. 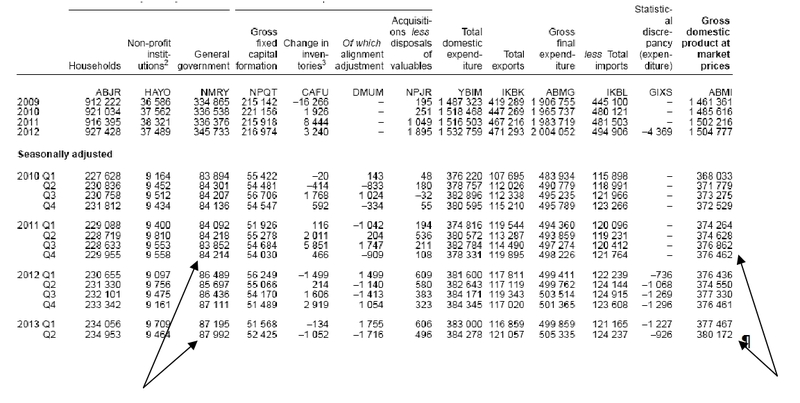 Change in Balance Sheet Components, US NFCs, 2008 to Q2 2013, US$bn. Total assets of US NFCs have risen by nearly US$4trillion over the period which is equivalent to approximately 25% of US GDP. 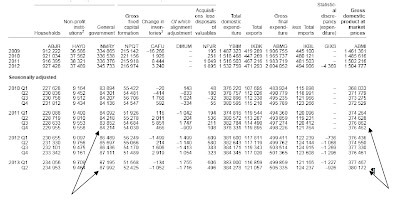 The increase in net assets of US$2.8bn (after accounting for the rise in liabilities over the same period) is more than accounted for by a rise in financial assets of over US$3 trillion. By comparison the rise in the current cost value of business equipment has been less than one-tenth that (and is accounted for by inflation). Within the rise of financial assets, cash or near-cash instruments have contributed a rise of nearly $600bn (the biggest single contributor in the accounts is ‘miscellaneous financial assets’). The same is true in other capitalist economies. In 1995 the investment ratio in the Euro Area was 51.7% and by 2008 it was 53.2%. It fell to 47.1% in 2012. In Britain the investment ratio peaked at 76% in 1975 but by 2008 had fallen to 53%. In 2012 it was just 42.9% (OECD data). The cash hoards are no less striking. The total deposits of NFCs in the Euro Area rose to €1,763bn in July 2013 of which €1,148bn is overnight deposits. This is a rise of €336bn since January 2008, nearly all of which is in overnight deposits, €306bn. In Britain the rise in NFCs bank deposits has been from £76bn at end 2008 to £419bn by July 2013. In reality, this extraordinary accumulation of cash by NFCs began well before the immediate depression in 2008, along with the slump in investment. Both of these merit further elaboration elsewhere. The profitability (profit rate) of US firms and firms in other Western economies has fallen, and even the absolute mass of profits fell for a period in the recession. While the former has not recovered, the latter has. But this has not led to a corresponding rise in investment and the investment ratio has fallen sharply. The destination of of these uninvested profits is twofold. Owners of capital are in receipt of record payouts. And the financial assets of NFCs have risen dramatically, often primarily cash as firms are unwilling to risk any type of investment. This hoarded store of capital is both the main impediment to recovery and the potential source of resolving the current phase of the crisis. The latest publication from the Office for Budget Responsibility (OBR) is a strange document. It is a Forecast Evaluation Report which examines its series of completely wrong forecasts since it was established. Its firm assessment of these wildly over-optimistic forecasts is that it is not because it underestimated the impact of austerity, but then provides no other explanation for its consistent errors. 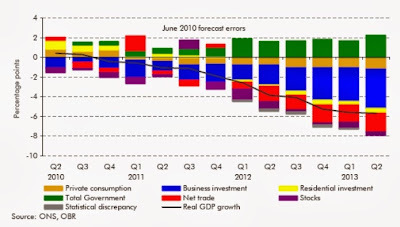 Despite this the OBR does provide some useful data on the economy and presents them in a very useful way. Below are a number of graphics taken from the latest publication. 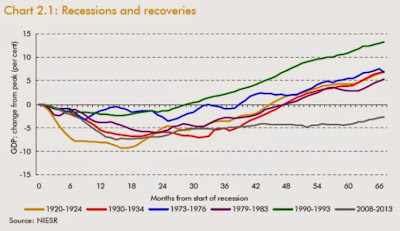 Chart 2.1 (from the NIESR) shows the latest slump in historical context. The British economy is still 3.3% below its previous peak. In every other recession the lost output had been recovered after no more than 4 years. The current slump s already more than 5 years old. Chart 2.23 shows how much further ‘fiscal tightening’ (combined spending cuts and tax increases) has been implemented and how much is still to come. The Fiscal Year 2012/2013 ended in April this year. By FY 2017/18 the fiscal tightening will be more than 3 times as great as the fiscal tightening already completed. If these plans are implemented, either by the Tories or by Labour, the next government will be implementing austerity measures twice as severe as anything seen to date. The key problem for the whole economy remains one of contracting investment. In Table 2.1 the OBR shows that in the latest data business investment is the only component of GDP which has been negative. It also overwhelmingly accounts for the shortfall in growth relative to the OBR’s own forecast, 4% of total shortfall of 5.7%. This is illustrated graphically the chart below, which highlights the components of growth relative to OBR forecasts. It is clear that business investment (blue) accounts for the bulk of the shortfall, with most of the remainder accounted by the shortfall in net trade (red). This is related to the fall in investment and the declining international competitiveness of the British economy. What the OBR calls ‘Total Government’ has been the prop for the economy over the entire period compared to its own forecasts. But in reality there is no such thing as Total Government in terms of economic activity. The activity of Government, like every other economic agent can only either be consumption or investment. SEB has previously shown that the government is increasing its consumption while cutting its investment. This is leading an economy-wide rise in consumption and an economy-wide decline investment. Exceptionally weak growth caused the lack of business investment, a recent increase in government consumption combined with continued reductions in its own investment and the threat of much greater austerity to come; these are the prevailing trends in the British economy. In a recent piece for The Guardian the argument that government spending led the very weak recovery has been reviewed in the light of the publication of the final GDP data for the 2nd quarter of 2013. Because of revisions to the data, it is no longer statistically correct that the entirety of the recovery is accounted for by government spending. The final release from the Office for National Statistics (ONS) shows that real government current spending began to rise after the 3rd quarter of 2011. 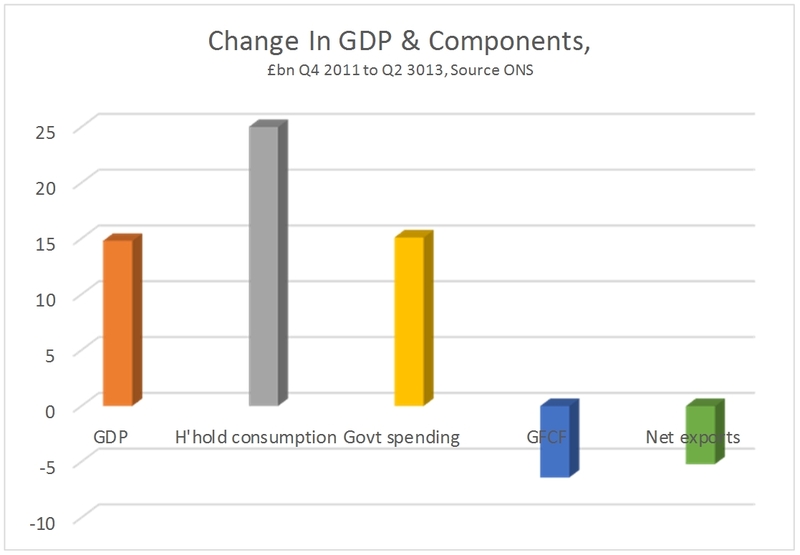 By the 2nd quarter of this year government consumption had risen by £7.7bn. Over the same period real GDP has risen by £11.7bn. As a result, the rise in government consumption accounts for two-thirds of the weak recovery over the same period. It remains the case that the rise in government day to day spending led the recovery. It began to rise in the 4th quarter of 2011 whereas GDP did not begin to rise until the 3rd quarter of 2012, that is 3 quarters following the rise in government consumption. Therefore it remains the case that it was not austerity that led to the very weak recovery. Instead, rising government consumption led the recovery and statistically accounts for two-thirds of it. Changes in GDP and its components are shown in the chart below, from Q3 2011 when government consumption began to rise. It is notable that household consumption is also rising and is the largest single contributor to growth over the period. Meanwhile, despite all official claims to the contrary investment continues to decline. 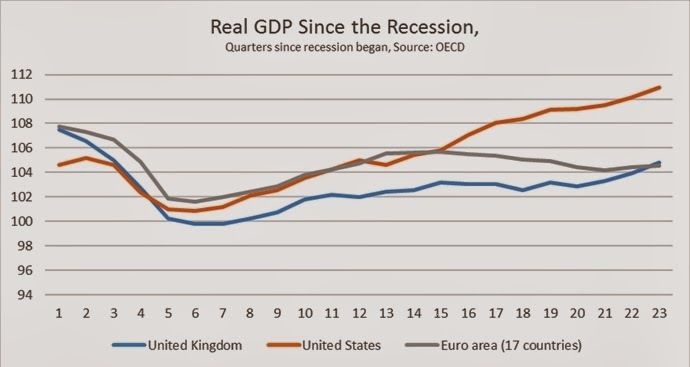 Since the recession began in 2008 the total decline in GDP has been £52bn and despite all talk of recovery the economy is still 3.3% below its prior peak. This is the worst performance in the G7 apart from Italy. The decline in investment is much greater than the decline in GDP. Over the same period the decline in investment (Gross Fixed Capital Formation) has been £64bn, which more than accounts for the entire decline in GDP. The decline in investment also led the slump as a whole. GFCF peaked in the 3rd quarter of 2007 and over that period has fallen by £71.4bn. The fall in investment more than accounts for the recession and led it. Business investment alone (excluding investment by both government and private individuals) fell by £43.2bn over the same period. 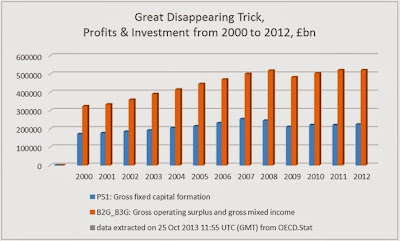 By itself the decline in business investment accounts for the bulk of the contraction in GDP of £52bn. This is the source of the economic crisis, and is shown in the chart below. Even while the government has been increasing consumption expenditures it has continued to cut its own investment. Since the 3rd quarter of 2011 government investment has fallen by £1bn and since the Comprehensive Spending Review of 2010 it has fallen by £4.4bn. This reproduces all the worst aspects of British long-term economic decline. Consumption is rising while investment is falling. No economic theory supports the idea of consumption-led growth. This is for the simple reason that if the productive capacity of the economy is not being increased simultaneously through investment, then all that is being consumed is that productive capacity. Despite much fanfare the government has not added any investment at all during its time in office. Much of the large-scale investment currently taking place such as Crossrail was inherited from the previous government and difficult to cancel. Where it could cancel investment it did so, such as the building programme for schools. The government is content to cut investment while increasing its own consumption and belies any notion the deficit-reduction or sustainable recovery are the goals of economic policy. To invest in plant, machinery, equipment (including transport equipment and facilities) is to expand the means of production. Since the whole purpose of austerity is to drive up the profit rate of private capital, increasing state-led investment is ruled out. This would place an increasing proportion of the means of production into state hands and not in the hands of private capitalists. It is also why the government is willing to cajole, subsidise and even bribe firms to invest but unwilling to invest on its own account. The lack of success in this field is attributable to fact that those same firms do not yet judge profits to have recovered sufficiently to risk increasing investment. Therefore there remain only two paths out of the current crisis. The current weak recovery is only supported by increasing government consumption and is not sustainable (although it may be the intention to continue this up to the next election). The private sector-led resolution of this crisis sought by the government requires an increase in the profit rate to be achieved by cutting wages, lengthening the working day and scrapping existing productive capacity. The alternative solution remains state-led investment with the government directing investment in key sectors of the economy, taking over a number of them where necessary. The announcement by Ed Miliband that Labour would temporarily cap energy prices is a welcome one. But the reaction to it reveals to deep-seated problems of the British economy and British politics. According to Labour’s own (uncontested) research household energy bills have risen by 29% in 3 years. Therefore the pledge to cap prices rises for 20 months is really a very modest reform. According to a campaign tool ‘Freezethatbill’ the average household has seen bills rise by £300 under the Tories and will save £112 a year from this policy. That would be an estimated saving of £160 in total. The reaction to this moderate plan has been vociferous and extreme. Lurid headlines about the lights going out in Britain have been accompanied by open threats from the large energy companies to discontinue investment. SEB has long argued that the cause of the slump is an investment strike by private firms. The energy companies threatened to make that an all-out strike in their sector. The Tory energy secretary and a host of MPs immediately relayed the threats of the energy companies. This is hardly surprising given the very large donations those companies make to the Tory Party. The Tory Press did likewise. However it cannot be argued that this was simply scaremongering, based on empty threats. It is already the case that the energy companies do not invest sufficiently, either in storage capacity or in renewables. The energy companies, especially those controlling energy reserves, have previously withheld supplies in order to push up prices. It was previously reported that in March this year the British economy was just half a day away from running out of gas. But the reality was that energy companies withheld available supplies, which drove up liquefied natural gas prices to 150p a therm, from 57p earlier in the year. In pursuit of profits, the energy companies have been willing to collude in driving up prices, and endangering supply. They are able to do this, in part, because existing capacity is extremely limited and they are an oligopoly. This is the real threat to Ed Miliband’s policy. Clearly the price pledge is only relevant if wholesale energy prices are rising. Capping retail prices for business and household consumers while wholesale prices are rising can only lead to a profits squeeze. As a result the energy companies threaten that they will reduce their already inadequate level of investment, even while some of them have caved in on the temporary price freeze. This could lead to energy shortages and would end Ed Miliband’s much more ambitious goal of de-carbonising energy production by 2030. The financial position is clear. Taking the shareholder payout from just British Gas, Centrica, Scottish & Southern Electricity and National Grid alone the current annual dividend is £3.4bn. Yet despite the imperative for investment in renewables, the level of investment has halved from already low levels over 3 years. This private investment slump has been exacerbated by the withdrawal of state investment in the energy sector under this government. Private companies have proved incapable of providing the necessary investment for long-term projects over a prolonged period. They are simply unwilling to take the risk. Yet the current government has reduced its own investment in subsidies for renewables which reflects its commitment to the oil companies and in pursuit of the illusory benefits of fracking. Ed Miliband’s policy of capping energy prices is very welcome. It makes a small contribution to softening the fall in living standards. But the extreme response to it highlights the complete unwillingness of the energy companies to provide the necessary investment in renewables and storage capacity. De-carbonisation and energy security require large-scale state-led investment. Instead dividend payouts to shareholders are at record levels. Faced with sabotage and threats from the energy companies, nationalisation is a necessary step that can lead to the investment that is imperatively required. The government and its supporters have been quick to claim that the most recent GDP data have vindicated its austerity policy. George Osborne says the argument in favour of austerity has been won some more excitable commentators have even talked of a boom. Usually, SEB would provide analysis of the GDP data after the publication of the national accounts, the third release in the cycle from the Office of National Statistics, which provides a detailed breakdown of the components on economic activity and the final revision to the data. But the claims made for the British economy following the most recent GDP release (and some subsequent surveys) are so outlandish, and so at odds with the facts, that is worth providing a short analysis now. The data is still partial and subject to revision. But there is enough evidence to demonstrate factually that the weak recovery is not a reward for austerity, but is in fact entirely a function of increased government spending. The economy has expanded by just 1.8% in 3 years of austerity, an annual rate of 0.6% which is less than one-quarter of previous trend growth. The gap between the current level of GDP and trend growth for the British economy is widening. In addition, the growth to date is entirely a function of increased government spending. This verdict is so at odds with both stated government policy and the overwhelming commentary on the latest data. Therefore it is important to provide the hard evidence supporting this analysis. 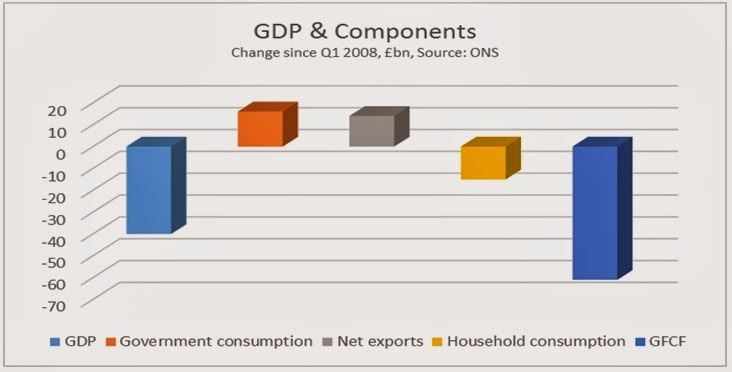 The can be found on Table C2 of the latest release, Second Estimate of GDP, Q2 2013 (ONS). Total government current spending was barely changed from the time the Coalition took office to the end of 2011. (In the ordinary course of events real government spending should rise in line with population growth and in a recession should rise much faster to offset the effects of recession. Unchanged government spending represents a harsh ‘austerity’ stance). However, from the 4th quarter of 2011 to the 2nd quarter of 2013 government current spending has risen decisively by an annualised £15.1bn. GDP did not begin to expand until two quarter later. This is the time lag SEB has previously identified in the relationship between changes in government spending and changes in GDP. Rising government spending has led the recovery. While the increase in government spending since the 4th quarter of 2011 to the most recent quarter amounts to £15.1bn, the rise in aggregate GDP over the same period is just £14.8bn. Therefore, the rise in government spending not only led the recovery, but more than accounts for the entire expansion over the same period (as some other components of GDP have contracted). Rising government current spending tends to support consumption, which is exactly what has happened over the last 18 months. The rise in household consumption has been the strongest of all components of GDP over that period, rising by £25bn. The chart below shows the changes in the national accounts since the government began increasing its current spending after the 4th quarter of 2011. But weak household spending is not the source of the crisis. This remains the slump in investment. GDP is still £50bn below its previous peak in the 1st quarter of 2008, but investment (Gross Fixed Capital Formation) is £65bn lower. Household consumption also remains below £24bn its pre-recession peak. But it has been rising continuously for 2 year and now accounts for under half of the total decline in GDP. The fall in GFCF more than accounts for the entire fall in GDP. It is not possible from the partial release of the data for the 2nd quarter of 2013 to establish the role of government in the continuing investment strike. But from the 1st quarter national accounts, it is clear that declining government investment has been exacerbating the private sector decline in investment. 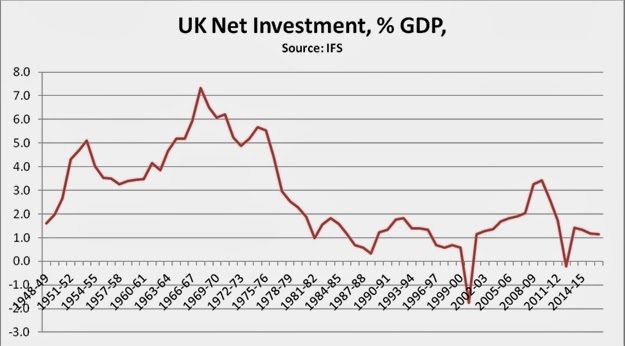 Government investment peaked under the last Labour government and has been cut continuously ever since. But the analysis is confirmed by the separate ONS data on public finances. The presentation of the public finances data vary significantly from the presentation of government consumption data in the national accounts. Among the many differences is that the former are presented in nominal terms only. Even so, these show (Table PSF5) that in nominal terms the level of departmental outlays rose to £305bn in the first half of 2013, from £283bn in the same period of 2012. This is a rise of 7.8% and way above the rate of inflation. There is no mystery to the current very weak recovery. It is led by a moderate increase in government spending, which more than accounts for the entire increase in GDP over the same period. This runs counter to the government’s stated ‘austerity’ policy. But it is accompanied by a cut in government investment, which exacerbates the private sector investment strike. It is this investment strike which remains the source of the crisis, which cannot be resolved by increasing current spending. Logic would dictate that any government which wanted to support the economy would increase investment, which is the source of the crisis. Conversely, any government fixated on deficit reduction would probably be inclined to cut both current and capital spending. This government is committed to neither economic recovery nor deficit-reduction. Instead, it is committed to boosting profits. That is why it is willing to increase current spending which supports consumer demand but refuses to increase investment as this would displace private capital from potentially profitable sectors of the economy. Since this government is not sticking to its own spending plans, it makes even less sense for an incoming Labour government to do so. Instead, it needs to address the source of the crisis by increasing state investment. The period since the international financial crisis began has for the first time in over a century seen the US displaced as the world’s largest industrial producer – this position has now been taken by China. It has also witnessed the greatest shift in the balance of global industrial production in such a short period in world economic history. In 2010 China’s industrial output exceeded the US marginally but this has now been consolidated into a more than 20% lead with the gap still widening further. In 2007, on UN data, China’s total industrial production was only 62% of the US level. By 2011, the latest available comparable statistics, China’s industrial output had risen to 120% of the US level. China’s industrial production in 2011 was $2.9 trillion compared to $2.4 trillion in the US – this data is shown in Figure 1. When the comparable data is released for 2012, China’s lead will have increased substantially– between December 2011 and December 2012 China’s industrial output increased by 10.3% whereas US industrial production increased by only 2.7%. Calculations based on estimates in the CIA's World Factbook indicate in 2012 the value of China's industrial production was $3.7 trillion compared to $2.9 trillion for the US – which would mean China's industrial production was 126% of the US level. Taking only manufacturing - that is excluding mining, electricity, gas and water production - in 2007 China’s output was 62% of the US level, by 2011 it was 123%. Again the gap has widened in 2012 and 2013. No other country’s industrial production now even approaches China - in 2011 China’s industrial output was 235% of Japan’s and 346% of Germany’s. World Bank data, using a slightly different calculation of value added in industry, confirms the shift. On World Bank data China’s industrial production in 2007 was only 60% of the US level, whereas by 2011 it was 121%. Therefore in only a six year period China has moved from its industrial production being less than two thirds of the US to overtaking the US by a substantial margin. If China was the ‘workshop of the world’ before the international financial crisis it is far more so now. The trends producing such dramatic shifts in such a short period are shown in Figure 2. In six years China’s industrial output almost doubled while industrial production in the US, Europe and Japan has not even regained pre-crisis levels. To give precise statistics, between July 2007 and July 2013 China’s industrial production increased by 97% while US industrial output declined by 1%. Industrial production data for July is not yet available for the EU and Japan, but between June 2007 and June 2013 EU industrial output fell by 9% and Japan’s by 17%. It is this enormous rise in China’s output which also drove the much discussed global shift in industrial production in favor of developing countries - in the six year period to June 2013, the latest date for which combined data is available, industrial production in advanced economies fell by 7% while output in developing economies rose by 65%. As is clear from Figure 3, China accounted for the overwhelming bulk of the increase in the developing economies. Industrial production in Latin America rose by 5%, in Africa and the Middle East by 6%, and in Eastern Europe by 10%. But China’s industrial production in this period rose by 100% - industrial output in developing Asia as a whole rose by 65%, but the majority of this was accounted for by China. The quite literally historic scale of these shifts makes clear that by far the most important development in world industrial production in the last period is this extraordinary rise of China. Between 2007 and 2011 China’s industrial production rose by $1,465 billion, in current prices, while US industrial output rose by only $88 billion in current prices and declined slightly in inflation adjusted terms. China’s industrial production rose by 17 times as much as the US. Such a rise in China’s industrial production has consequences spreading far beyond industry itself. Industry has easily the most rapid increase in productivity of any economic sector – notably compared to services. The decline of industrial production in the EU and Japan, and relative stagnation in the US, means China is cutting the productivity gap between itself and the advanced economies. This is crucial for progress in raising China’s relative GDP per capita and living standards. This rising productivity also explains why China’s exports have been able to maintain their competitiveness despite substantial increases in the exchange rate of China’s currency the RMB. On Bank for International Settlements data, the RMB’s nominal exchange rate rose by 25% between July 2007 and July 2013. But China’s real effective exchange rate, that is taking into account the combined effect of the nominal exchange rate and inflation, rose by 31% But despite this major currency revaluation China’s exports continued to exceed its imports. The ability of China to successfully absorb such high increases in its exchange rate, due to high levels of industrial productivity increases, directly translates into relatively lower prices for imports and improved relative living standards for China’s population. This data also settles the dispute between who believed there was a major industrial revival in the US, such as the Boston Consulting Group, and Goldman Sachs and other analysts who correctly concluded no such major revival has occurred. Those in China, such as Lang Xianping, who wrote that a great US industrial revival was taking place and China’s industry was in crisis look foolish in the light of data showing China’s industrial output doubled in a period when US industrial production did not grow at all. The only reason US industrial performance does not appear very weak, with negative net growth over a six year period, is because of the even worse performance of a major decline in industrial output in the other advanced economic centers – the EU and Japan. It is naturally important not to exaggerate this scale of advance by China in industrial production. China’s industrial output is now considerably larger in value terms than the US, but the United States retains a substantial technological lead which it will take China a considerable period to catch up with. Due to a long period of globalization and consolidation by US companies, both processes which are only at early stages in China, US manufacturing firms are still four times the size of China’s in terms of overall global revenue– although between 2007 and 2013 Chinese manufacturing firms overtook Germany to become the third largest manufacturing companies of any country. The scale of these changes in world industrial production also make clear that in comparison to developments in China gas and oil ‘fracking’ in the US, which have attracted widespread media attention, is merely a statistical sideshow – as already noted overall US industrial production has not even recovered to pre-crisis levels. For the first time for over a century the US has been definitively replaced as the world’s largest industrial producer. Such a once in a century shift can literally only be described as historic. The momentous decision by Parliament on August 29 not to participate in a military attack on Syria raises important points both for the trends in British politics and for economic policy. SEB has repeatedly argued that there is no prospect of a Tory election victory in 2015. After the failure of Cameron’s military agenda the certainty of a Tory loss has become the possibility of an electoral rout. In politics, whoever sets the agenda wins and the Tory agenda has spectacularly unravelled. There is too a direct economic impact from the vote and the potential for an indirect impact. Britain spends far more than comparable countries on warfare. Now that there is clearly a diminished appetite for foreign wars and adventures this should be addressed. There is a great deal of publicity about cuts to the Ministry of Defence Budget under this government. However, the cuts are focused on planned current spending. The capital budget is rising. In addition, this government has introduced an entirely new Budget category something called the ‘Special Reserve’, which has only been used to fund military operations. It should be noted that this is only the official estimates of military spending. In their book The Three Trillion Dollar War Joseph Stiglitz and Linda Blimes examine the full costs of the Iraq and how the US Administration has disguised them. The medical costs of treating war veterans, as well as social consequences and their costs, all of which apply to Britain and are not identified in government accounts. Britain has the 4th largest military spending in the world. The economy is only the 7th largest in the world. Successive British Prime Ministers have been committed to Britain ‘punching above its weight’, that is, spending a disproportionate amount on the military and using it. The current Prime Minister has been blocked in his attempt to repeat that. A cut in defence spending to Britain’s close economic peers, countries like Italy and Brazil, would yield a saving of at least £14bn per annum at current levels. The potential indirect impact arises in relation to the renewal of Trident. Britain does not have an independent nuclear deterrent as it is wholly operationally dependent on US satellite systems. It is precisely the type of expenditure which is designed to project imperial power, and allow Britain to ‘punch above its weight’. After the vote against military action against Syria it seems glaringly obvious that the pursuit of Trident renewal is a pointless and absurdly expensive exercise. The replacement cost and running costs are estimated by CND to rise to £100bn over the lifetime of the programme. These are extraordinary sums for a system that could never be used, or could only be used if the US wished to pursue nuclear war against another country. The Coalition has cut government investment across the board, in the vain hope that private firms will increase their investment. Transport, housing, education, health and infrastructure are all deteriorating as a result. Redirecting resources away from the military budget is one simple method of financing the state-led investment that the economy needs. Publication of US 2nd quarter GDP data, following that for China, makes it possible to accurately compare the recent performance of the world's two largest economies. The results are extremely striking as they show that in the last year the slowdown in the U.S. economy has been far more serious than in China. Consequently the data shows that while both economies are being adversely affected by current negative trends in the world economy, China is dealing with these more successfully than the U.S. Intense media discussion in China about its ‘slowdown’ is therefore misplaced unless equivalent attention is paid to understanding why the US economic slowdown is much worse than China’s. To accurately establish the facts, it should be noted China and the U.S. publish their economic data in slightly different forms. It is therefore necessary to ensure that like is compared with like. The U.S. emphasizes annualized change in GDP in the latest quarter compared to the previous one; for the newest data this means it takes the growth between the 1st and 2nd quarters of 2013 and basically multiplies it by four. China emphasizes the growth between the 2nd quarter of 2013 and the same quarter in 2012. Both methods have advantages and disadvantages. Quarter by quarter comparisons depend on seasonal adjustments being accurate, which is not always the case, while year by year comparisons are less sensitive in registering short term shifts. But in the present case the conclusion is not fundamentally changed whichever method is used. If the method emphasized by China is used, then, as shown in Figure 1, in the 2nd quarter of 2013 China's GDP grew by 7.5% compared to a year earlier, while U.S. GDP grew by 1.4%. This means that China's economy grew at over 500% of the rate of the U.S. economy. Using the method preferred by the U.S. China's annualized GDP growth in the 2nd quarter was 6.8% and the U.S.'s was 1.7%, which means that China's economy grew at 400% of the rate of the U.S. economy. Due to the difficulties of making accurate seasonable adjustments in both China and the U.S., the author would emphasize the year on year comparison; but whichever method is preferred China's economy was growing at 4-5 times the speed of the U.S. economy. If the whole period since the international financial crisis began is taken then the disparity in growth between China and the U.S. is even more striking. In the five years up to the 2nd quarter of 2013 China's GDP grew by 50.7% and U.S. GDP by 4.5% (Figure 2). China's GDP grew more than ten times as rapidly as the U.S. Turning to the most recent period, it is widely understood that since the beginning of the international financial crisis, China's economy has far outperformed the U.S., even if the dimensions of this are not clearly grasped. What is not so often understood is what has happened during the last year. During that period the economies of both China and the U.S. slowed, indicating the negative trends in the international economic situation. But the U.S. slowed far more than China. China's year on year GDP growth fell from 7.6% in the 2nd quarter of 2012 to 7.5% in the same quarter of 2013 - a decline of 0.1%, or a 1.3% deceleration from the initial growth rate. However the year on year growth rate of the U.S. in the same period fell from 2.8% to 1.4% - that is by 1.4% or by 50% of the initial growth rate (Figure 3). Consequently China's growth fell marginally but the U.S.'s growth rate halved. Furthermore, as the Financial Times correctly pointed out in its editorial on the latest U.S. data, U.S. economic growth has been particularly depressed in the last nine months. In that total period the U.S. economy grew by only 0.7%, or an annualized rate of under 1%. In the same period China's economy grew by 5.3%, or an annualized rate of slightly over 7%. Therefore if over the entire course of last year China's economy has been growing at 4-5 times the speed of the U.S. economy, in the last nine months China's economy has been growing at 7 times the speed of the U.S. This does not mean that the US cannot partially recover from its extremely depressed 1.4% annual growth rate in the last year – the 10 year moving average of US annual growth is 1.8% and its 20 year annual moving average is 2.5%. But even recovery to these rates would leave the US growing at only one third of the rate of China. The latest data therefore shows that the global economic discussion about the present world economic situation is not about China's "slowdown" and U.S. "recovery". It is "why is China coming so much more successfully through an adverse global economic situation than the U.S.?" And "why has the U.S. economy slowed so much more dramatically than China's in the last year? An earlier version of this article appeared at China.org.cn.